Primarily we are an independent drinks wholesaler, distributing to the West Wales licenced trade. 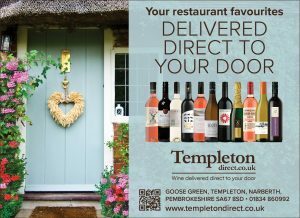 After years of experience and closely following the ever evolving drinks market; at Templeton we have identified the opportunity to share certain areas of our shippers and importers vast wine portfolios, combined with our range of specialty Bottled Beers, Lagers & Ciders with you, the home drinking connoisseur. At Templeton Beer Wine & Spirit Co Ltd we have access to over 5000 wines. Many are limited strictly to ‘trade only’, however through Templeton Direct we hope you will discover many close relatives to the great wines you enjoy at your favorite pub or restaurant. To discuss what we can offer and supply, or to place your order please call our friendly team or send us an email using the form below.